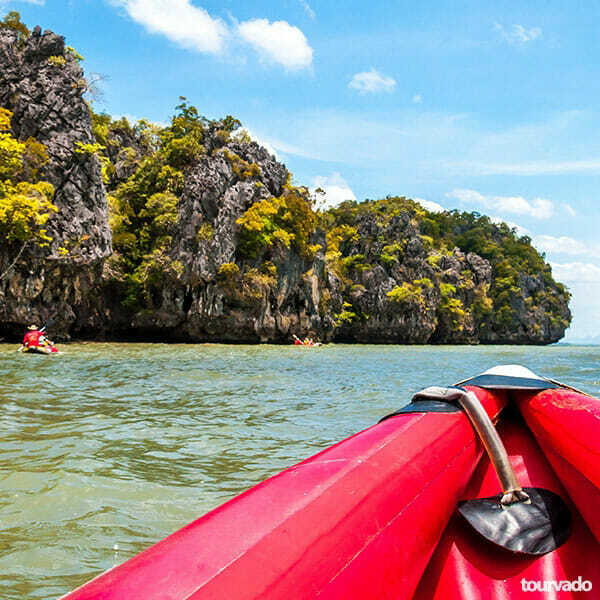 while the Transfer to: Sirai Bay, Cherngtalay, Laguna, Layan beach, Bang Tao, Mai Khao, Surin, Kamala, Nai Harn, Rawai, Nai Yang, Panwa, Nai Thorn is of 150 Thai Baht per Person and will be paid in cash during the tour. 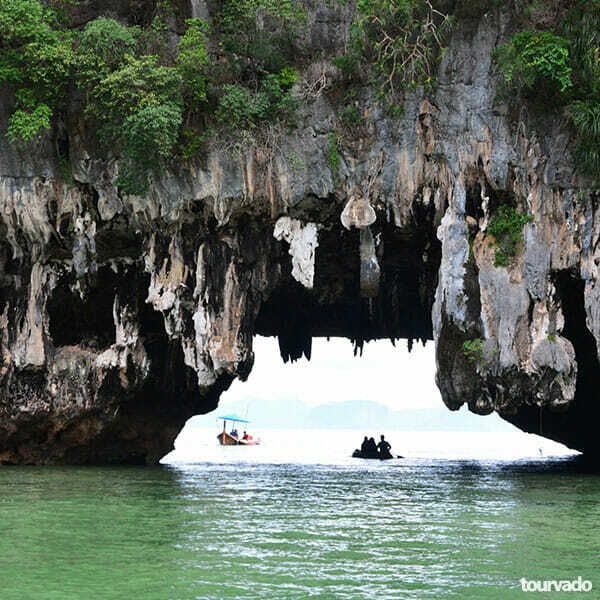 Phang Nga Bay Day Cruise Tour from Phuket starts with land transportation Pick up from your hotel and transfer to Ao Por Pier. The tour activities starts with great canoeing and sightseeing time as we depart to Panak and hong island. For your meals and sightseeing you will enjoy a great buffet lunch at the famous Panyee island fisherman village and we will be visiting together than James Bond Island. 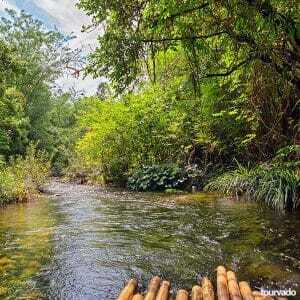 A leisure time will be ahead swimming and relaxing at Naka island. Ending the full day tour we return. Back to Ao Por Pier and transfer to your hotel. 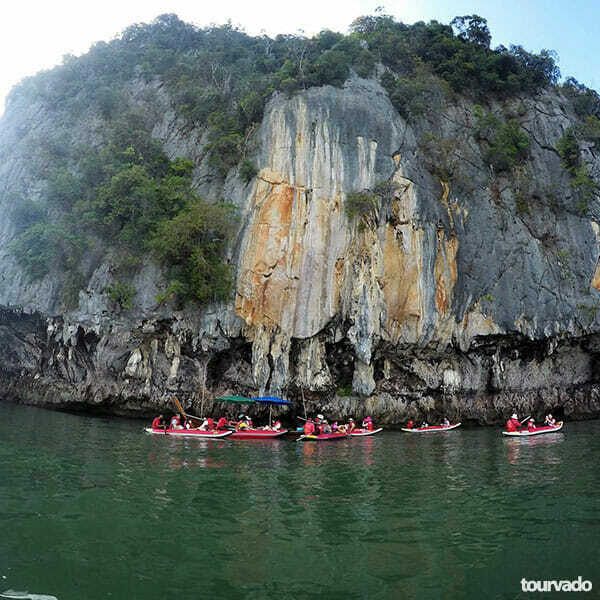 Phang Nga Bay Day Cruise Tour from Phuket is a full day trip by a comfortable and exclusive Big Boat. 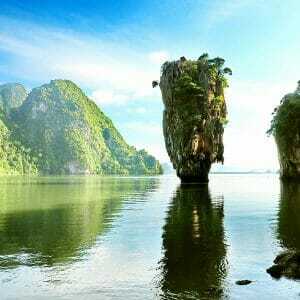 travelling within Phang Nga bay you ewil discover James Bond Island where the James Bond movie Man with The Golden Gun Was filmed in 1974. The Phang Nga National Park has most spectacular scenery and is to unique vast area that was also used to shoot some helicopter scenes for the movie Jurassic Park. Here is the bay where many secret lagoons open into the rocks of different cliff islands to meet amazing majestic caves formations. 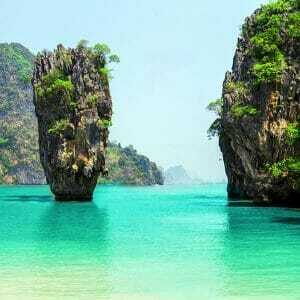 This trip is highly recommended to get a true picture of Thailand nature and shoot amazing pictures. Enjoy the great relax of having a full day tour with all this inclusions such as transports from you departing point to the pier and back, soft drinks, coffee and tea, drinking water ,buffet lunch, your personal life jacket, a vary entertaining tour guide, tour insurance. Customers personal extra expenses such as souvenirs or extra drinks. Not Allowed: If You are pregnant woman, mature people with age over 70 years old, having any medication disability (such as; back pain & heart disease), infants under 1 (one) year old. while the Transfer to: Sirai Bay, Cherntalai, Laguna, Layan beach, Bang Tao, Mai Khao, Surin, Kamala, Nai Harn, Rawai, Nai Yang, Panwa, Nai Thorn is of 150 Thai Baht per Person and will be paid in cash during the tour. A few of the destinations were somewhat busy but overall exceptionally lovely. Our guide produced our excursion really unique and memorable. Very well organized. Tour guides were superb. Tour operator personnel outstanding, food loads at dinner. Well worth the cash, organized and also we had on tour a wonderful guide!